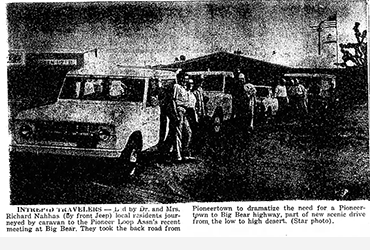 Pioneertown–The Red Dog Cafe was the scene of 58 cars and more than 230 people from behind and low desert who rendezvoused for the trek to Big Bear City–pine-covered mountain resort in the San Bernardino Mountains. 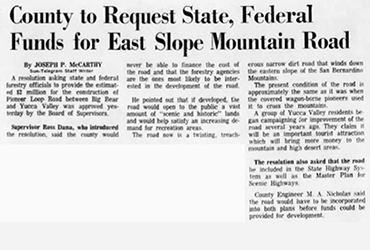 The lead car carried the slogan “We Want a Road to Big Bear,” and cars carry banners for the villages of Desert Hot Springs, Morongo Valley, Pine Wells, Yucca Valley, Pioneertown, Joshua Tree, Sunfair and Twentynine Palms. Civic leaders and members of the Associated Chambers of Commerce who handled the caravan were: Ted Richardson of Twentynine Palms, President of the Associated Chambers; Marty Dodge, secretary, of Joshua Tree; and Jules Boltazar, chairman of the caravan of Yucca Valley. Guests attending were Walt Campbell, assistant county highway commissioner, representing Commissioner M.A. Nicholas; Lt. Doc Martin of Twentynine Palms sheriffs substation, representing Sheriff Frank Bland; and Mr. and Mrs. S.S. Stanley of San Bernardino and Twentynine Palms, Mr. and Mrs. Jesse Ferguson representing Valle de las Vista Club, Twentynine Palms. Both Yucca Valley and I am your town work cooler than other villages since they are located at a higher altitude. The cars were directed on their way by Lt. Doc Martin add spaced about 200 feet apart for the trip beginning with the first car out a pall of dust hung over the trekkers. From the altitude a 4000 feet at Pioneertown the proposed road, which is now little more than a well-defined trail–passable but not recommended to a greenhorn–the cars steadily client to higher and cooler altitudes. Three or four of the cars and some of the jeeps had to resorts to dry-portages over the steeper grades. Clay turn stall of the highway garage at Yucca Valley at thoughtfully donated his tow truck and personal service for the trip. The rugged, rough and rocky road wends through undeveloped and scenic mountains of sheer beauty. The joshua trees hidden in the fastness of the mountains along the way make those same trees on the desert look like shrubs, while the fir and pine trees became increasingly larger along the routes to the rendezvous at Baldwin lake. Riding shot gun with Lt. Martin the caravan was in constant touch with the sheriff’s station at Big Bear at all times. When the caravan reach Baldwin Lake. Capt. 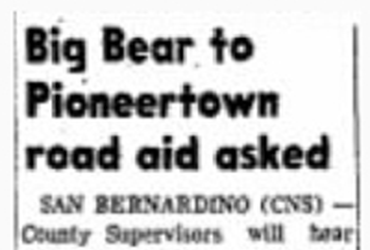 Kendall Stone sped to meet the visitors, followed by Saff Minder, president; and Dave Lents, secretary-manager of the Big Bear City Chamber of Commerce. The mountain “Petticoat Patrol,” a group of experts equestrienne’s with their leader, guide Dee Johnson, added to the colorful welcome given to the visitors. A dozen cars filled with big bear citizens lead the caravan into and through the city to the Coldbrook Picnic Grounds. According to Ted Richardson there would be 22 miles of grading and straightening of dangerous curves necessary to make the road safe for the general public. Following the picnic lunches under tall pine trees coffee and dessert or served to the visitors, and welcome addresses were made by J. B. Quale, official host for big bear; Seth Minder and David Lents. Musical entertainment on Western guitars was provided by Floyd Taylor and Boots Pryor. The highly successful caravan of the associated chambers of commerce members who believe this is the coolest and most scenic route to the desert resorts–as well as making available year round vacation programs for tourists and resident alike.